On Wednesday, January 23, 2019, we lost one of our own. 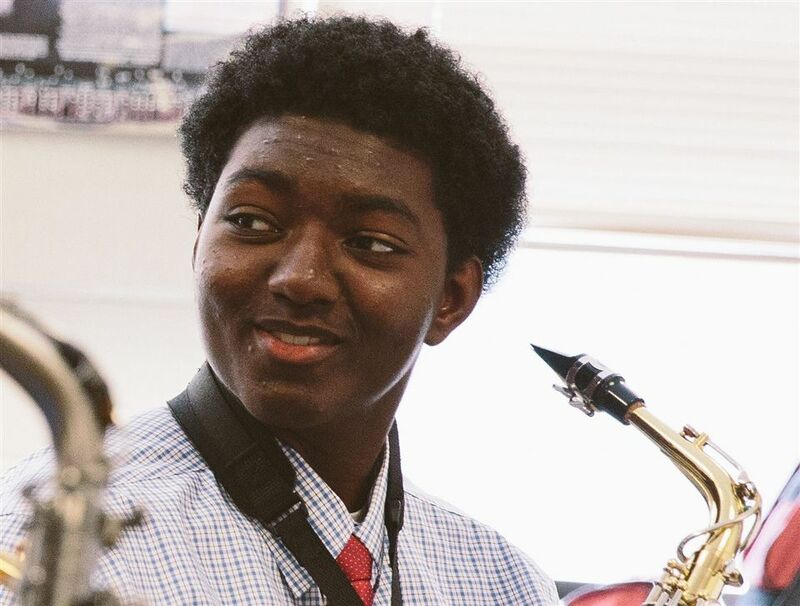 Mattheu Thomas ’19 passed away after valiantly fighting Osteosarcoma for over a year. Mattheu is survived by his brother Theo ’17 and his parents Sadra and Derrick, who is a member of our upper school faculty. Boys’ Latin was a second home to Mattheu. He entered 2nd grade with a radiant smile—a smile that lit up every room he entered. His smile was infectious and would come to symbolize the joy and love he brought to every situation. Even as he went through challenging treatments and difficult times, he always wanted to be on campus. He drew strength and energy from his classmates and teachers, considering everyone he met to be his friend. He has left an everlasting impression, an imprint, on our School, in our hearts, and on everyone he touched. Mattheu’s strength and optimism inspired us all. He personified the values of courage, compassion, and integrity that we, at Boys’ Latin, hold so dear. Below are the arrangements that the Thomas Family has made to celebrate Mattheu’s life, as well as a letter written by Headmaster Christopher Post to the Boys’ Latin community. Kindly join us in lifting up Mattheu and his family and keeping them in your thoughts and prayers. On Friday, February 1, there will be a viewing and final rites at Fresh Start Church from 3 pm – 8 pm. The last hour of this viewing (from 7 pm – 8 pm) will be focused on final rites. On Saturday, February 2, there will be a Service of Thanksgiving held in the Gelston Athletic Center, at The Boys’ Latin School 822 Lake Avenue Baltimore, MD 21210. The service will begin at 10 am, with refreshments to follow. Fresh Start Church will be live streaming. Click here to watch the services live. It is with a heavy heart that I share the tragic news of the passing of Mattheu Thomas, a member of the class of 2019. For more than a year, Mattheu has fought valiantly in his battle to confront and overcome Osteosarcoma, a cancer that first affected bones in his leg in the fall of 2017. Mattheu passed away this afternoon surrounded by family and loved ones. Mattheu is survived by his brother Theo ’17 and his parents Sadra and Derrick (our upper school technology coordinator). Mattheu has been a fixture in every facet of Boys’ Latin since his first days in our lower school. He’s fondly remembered as a thoughtful and kind student, whose warm demeanor and never-ending smile would bring joy to all those around him. In the upper school, Mattheu was a good student, and he was most proud of his work in the Diversity Club, playing varsity football, and playing the saxophone in our music ensembles. Mattheu was humble and kind, and he avoided any sense of the spotlight or public recognition. Over the course of the past 18 months, Mattheu has been an example of courage and grace. Whenever possible, Mattheu would be on campus, attending classes and participating in the full life of the school. Mattheu never wanted to speak of his illness. Instead, he would engage others in discussions about anything and everything, from sports to music to the full range of popular culture. In his senior speech that he delivered this fall, Mattheu reflected that as a younger student, all he wanted was for high school to move quickly and, now, all he wanted, was for time to slow down. When Mattheu returned to campus last week, our upper school and faculty from across our three divisions lined the driveway to greet him. As he drove through, he smiled and waved, and, as he was leaving, he shared with me just how much he missed being here, and how much he loved us. The loss of Mattheu is unfathomable. The family is making arrangements for celebrating Mattheu’s life, including holding a memorial service here on campus. As details become available, we will share those with the community. In the meantime, we will gather with our upper school students and faculty tomorrow morning, to offer reflections and begin to share in our grief together. Mattheu’s life will be recognized in the lower school and middle school in age-appropriate ways. There will be counselors available for our students as well. While I know that Mattheu’s suffering has ended, and I pray and believe that Mattheu is in a better place, I am overwhelmed by the loss of his presence in our lives. Please join us in holding Mattheu and his family close in your thoughts and prayers. (Cool) Progeny takes a look at character development. Boys are actively taught to think beyond themselves. We can’t wait to see what comes next. Don't miss the all-School art show with guest artist, Dave Eassa.